KIEV, Ukraine (AP) — The rough-looking young men brought clubs and brass knuckles to the Pechersk Monastery in Kiev , one of Orthodox Christianity’s most important pilgrimage sites, apparently seeking to disrupt worship. Police spread-eagled them against a wall decorated in faded centuries-old frescos of solemn saints, then hauled them away. On the other side of the dispute, at a small church in the center of Kiev, a dozen men organized round-the-clock guard duty, worried that nationalist radicals might make their third attempt in a year to seize the place of worship. The incidents a week ago underline the tensions in Ukraine as it prepares to establish a full-fledged Orthodox church of its own. The planned religious rupture from the Russian Orthodox Church is a potent — possibly explosive — mix of politics, religious faith and national identity. The imminent creation of the new Ukrainian church raises deep concerns about what will happen to the approximately 12,000 churches in Ukraine that are now under the Moscow Patriarchate. 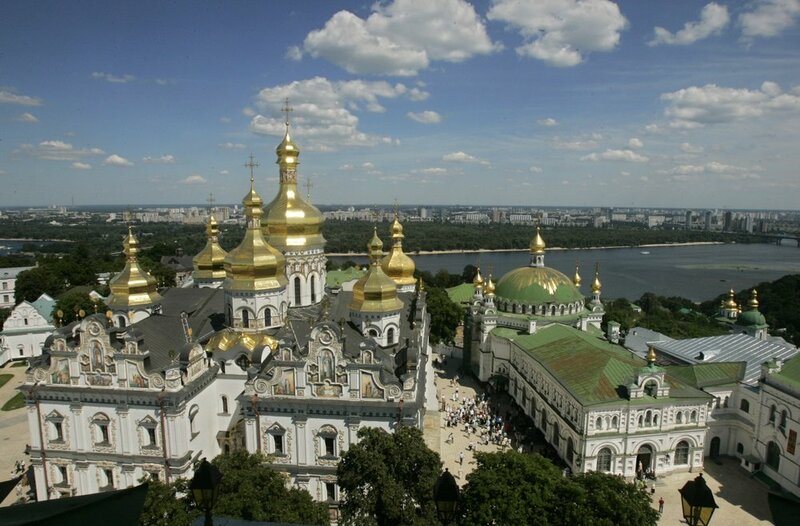 “The question of what will happen to the property of the Orthodox churches existing in Ukraine after the emergence of a single local church is key and could be one of the most painful” issues of the Orthodox split, said Volodymyr Fesenko, an analyst at the Ukrainian think-tank Penta. Since the late 1600s, the Orthodox Church in Ukraine had been a wing of the Russian Orthodox Church rather than ecclesiastically independent — or “autocephalous.” Many Ukrainians chafed at that arrangement, resenting its implication that Ukraine was a vassal state of Russia. Schismatic churches formed under their own Ukrainian leaders, but they were not recognized as canonical by the Ecumenical Patriarch of Constantinople, the so-called “first among equals” of leaders of the world’s Orthodox Churches. The Istanbul-based patriarchate last week removed an anathema against Ukrainian church leaders, a major step toward granting full recognition to a Ukrainian church that does not answer to the Moscow Patriarchate. The Russian Orthodox Church, furious at the move, announced it would no longer recognize the authority of the Ecumenical Patriarch. It also fears it will lose deeply cherished sites including the Pechersk Monastery, the seat of the church’s Ukrainian branch and a major tourist destination renowned for its richly decorated churches and labyrinthine caves holding the relics of holy men. It’s not exactly clear when the autocephaly will be formally granted. The two schismatic Ukrainian churches must meet to decide who will be the patriarch of the unified church. Once that decision is made, Constantinople is expected to grant the independence order. In recent years, about 50 churches in Ukraine that were under the Moscow Patriarchate have been forcibly seized and transferred to the Kiev Patriarchate, according to Metropolitan Antony Pakanich of the Moscow-loyal Ukrainian Church. Some believers say they will forcefully defend their right to stay. “The creation of a local church will push for a new round of confrontation ... we, who are supporters of canonical Orthodoxy, will defend our interests here,” said Ilya Bogoslovsky, a 28-year-old who came with his wife and daughter for a service at the chapel of the Tithes Monastery, where the guards had been deployed. Ukrainian President Petro Poroshenko, who has hailed the creation of the full Ukrainian church as “a guarantee of our spiritual freedom,” has pledged that there will be no action taken against parishes that choose to remain under the Moscow Patriarchate. But some Ukrainian nationalists appear ready to use force. In September, radical right-wingers broke into a church in western Ukraine, beat up a priest, drove parishioners away and locked the building. A leader of the ultranationalist C14 group, whose adherents have twice attacked the Tithes church in Kiev, sees the presence of Moscow Patriarchate churches in Ukraine as a form of propaganda by an “aggressor country” since the Russian Orthodox Church has close ties with the Kremlin. The Tithes church is “the Kremlin’s political tool,” Serhiy Mazur said. The war between Ukrainian government forces and Russia-backed separatists in eastern Ukraine, which began in 2014 and has killed at least 10,000 people, has also sharply increased the hostility toward the Moscow Patriarchate churches. Father Sergii Dmitriev, a chaplain in the Ukrainian army, was once part of the Moscow church but switched to the Kiev Patriarchate after the Russia-linked church began to refuse holding funerals for Ukrainian soldiers killed in the war. With such passions on both sides, the cleric feared that more violence between the two uneasy neighbors lay ahead. “The birth of a new Ukrainian church is taking place amid throes for which everyone should be prepared,” he warned. This is worrisome and could lead to a extention or expansion to the whole territory of Ukraine of the present civil war in the Eastern-Ukrainian Donbass region of Ukraine. The Russian Orthodox Church, furious at the move, could cooperate like in the past with Czarist Russian rulers with the Russian authorities, the Russian minority in Ukraine, Pro-Russian Ukrainian elements, Russian orthodox people inside Russia, Russian Cossacks, and Slavic Eastern-Orthodox christians who support the Russian Donetsk and Luhansk People's Republics (DPR and LPR respectively) in Eastern-Ukraine. This is a very tense situation in which religion merges with nationalism (Ukrainian nationalism vs Russian nationalism), international alliances and a huge tension within the Orthodox christian world. Which could be ssimilar to the Roman-Catholic vs Calvinist/Lutheran divide in the late middle ages in the Netherlands, Germany and France. The Russian Orthodox Church will not accept the confiscation of Orthodox churches, monastries and other buildings and the intimidation of Orthodox priests and believers. And the Russian Federation will not stand idly by when Ukrainian nationalists beat up Russian orthodox priests, drive parishioners away and lock Russian Orthodox churches. These Ukrainian far right ultra-nationalist thugs are dangerous, not only for Russian Orthodox communities, Russian orthodox priests, monks, nuns, and Russian orthodox families (husbands and wives, children), teachers and representatives, but also a danger to regional stability, peace, the Ukrainian economy and for neighboring countries like Poland, Slovakia, Hungary, Romania, and Moldova will have problems at their borders with Ukraine, because a large scale and vicious war in Ukraine with Ukrainian and Russian forces will not only cause great humanitarian suffering for the Ukrainian and ethnic Russian populations in Ukraine, but also a huge threat of border violations when combat comes close to the Polish, Slovakian, Hungarian, Romanian, and Moldovan border. And not only there also the threat at the Lithuanian, Latvian and Estonian borders with Belarus and the Russian Federation will be huge. Question is whether Belarus will remain neutral or choose sides? Slovakia is not particulary Pro-Ukrainian and Hungary has a pro Russian prime minister, Victor Orban. In a large scale civil war and war in Ukraine in the total territory of Ukraine, not only the Russian Federation and Ukraine will take part in such a war. Foreign fighters from from Serbia and Chechnya will take part in the fight on the side of the Donetsk and Luhansk People's Republics, the Russian Orthodox church and the Russian Federation. Next to that the the Donetsk and Luhansk People's Republics receive support from the notorious Kadyrovtsy, a paramilitary organization in Chechnya, Russia, that serves as the protection of the Head of the Chechen Republic. The term Kadyrovtsy is commonly used in Chechnya to refer to any armed Chechen men under the control of President Ramzan Kadyrov. The Kadyrovtsy has been criticized of being Ramzan Kadyrov's private army, and is accused of committing widespread human rights abuses such as kidnapping, forced disappearances, torture, rapes and murder. On the Ukrainian side there will be also foreign volunteers and allies. Foreign fighters mainly from Belarus, Georgia and Russia (about 100 men from each country) have joined the Ukrainian volunteer battalions. They were joined by fighters from the United States, France, Germany, Norway, Sweden, Georgia, Poland, Spain, the Czech Republic, the United Kingdom, Croatia, Italy, Albania and Canada. According to New York Times, there are three volunteer Islamic battalions fighting for the Ukrainian side. Next to that you have sinister, obscurantist para-military militia like the Special Operations Detachment "Azov", often known as Azov Battalion, Azov Regiment, or Azov Detachment, (Ukrainian: Полк Азов) is a Ukrainian National Guard regiment, based in Mariupol in the Azov Sea coastal region. In 2014, it gained notoriety after allegations emerged of torture and war crimes, as well as the Nazi sympathies and usage of associated symbols by the regiment itself, as seen in their logo featuring the Wolfsangel, one of the original symbols used by the German Nazi party. Around 10-20% of the unit were Nazis in 2014. At the same time, the regiment's soldiers come from 22 countries and are of various backgrounds. More than half of the regiment's members speak Russian and come from eastern Ukraine, including cities of Donetsk and Luhansk. The regiment's first commander was far-right nationalist Andriy Biletsky, who led the neo-Nazi Social-National Assembly and Patriot of Ukraine. In its early days, Azov was the Ministry of Internal Affairs' special police company, led by Volodymyr Shpara, the leader of the Vasylkiv, Kiev, branch of Patriot of Ukraine and Right Sector. The Dzhokhar Dudayev Battalion, originally named "Chechen battalion", was set up in March 2014. It was later named after Chechnya’s first president and insurgent leader Dzhokhar Dudayev and it is based in Novomoskovsk in Dnipropetrovsk Oblast. Most of the members the Dzhokhar Dudayev Battalion are ethnic Ukrainians, but there are also Chechens from European countries as well as from Chechnya and it also includes other Muslims like Azeris, Ingush and Tatars, as well as Georgians. The battalion "views the war as part of a broader struggle against Russian imperialism and the Kadyrov regime in Chechnya". The battalion specializes in subversion and countering the subversive groups. Another Chechen battalion, named after Shah Mansur, has been reported defending the front line near Mariupol in 2015. It was created by former Dzhokhar Dudayev Battalion members. And the Noman Çelebicihan Battalion is a battalion of Crimean Tatars based in Kherson region bordering Crimea. The battalion reportedly received assistance from Turkey. The Ukraine is not Western-Europe, nor Central-Europe, nor Southern-Europe or the USA and Canada in North-America. It is country with a very bloody past and heritage. Tartar, Polish and Russian invasions, pogroms, the First World War, the Polish–Ukrainian War and the Russian civil war. The Russian Civil War devastated the whole Russian Empire including Ukraine. It left over 1.5 million people dead and hundreds of thousands homeless in the former Russian Empire territory. Soviet Ukraine also faced the Russian famine of 1921 (primarily affecting the Russian Volga-Ural region). During the terror of the Bolsjewist regime of the SovjetUnion in the Stalin era, the man-made famine in Soviet Ukraine called the Holodomor took place in 1932 and 1933. During the Holodomor, millions of inhabitants of Ukraine, the majority of whom were ethnic Ukrainians, died of starvation in a peacetime catastrophe unprecedented in the history of Ukraine. The Communist leadership perceived famine as a means of class struggle and used starvation as a punishment tool to force peasants into collective farms. The mass killing operations that are known as the Great Terror in 1937–38 took many lives in the whole territory of the SovjetUnion. During 1930s and early 1940s Vinnytsia, a city in west-central Ukraine, was the site of massacres, first during Stalin's purges and then during the Holocaust in Ukraine and the Nazi occupation. The Ukrainian capital Kiev suffered significant damage during World War II, and was occupied by Nazi Germany from 19 September 1941 until 6 November 1943. During the Nazi occupation of Ukraine most of the Ukrainian SSR was organised within the Reichskommissariat Ukraine, with the intention of exploiting its resources and eventual German settlement. Some western Ukrainians, who had only joined the Soviet Union in 1939, hailed the Germans as liberators. Brutal German rule eventually turned their supporters against the Nazi administrators, who made little attempt to exploit dissatisfaction with Stalinist policies. Instead, the Nazis preserved the collective-farm system, carried out genocidal policies against Jews, deported millions of people to work in Germany, and began a depopulation program to prepare for German colonisation. They blockaded the transport of food on the Kiev River. The vast majority of the fighting in World War II took place on the Eastern Front. By some estimates, 93% of all German casualties took place there. The total losses inflicted upon the Ukrainian population during the war are estimated at between 5 and 8 million, including an estimated one and a half million Jews killed by the Einsatzgruppen, sometimes with the help of local collaborators. Of the estimated 8.7 million Soviet troops who fell in battle against the Nazis, 1.4 million were ethnic Ukrainians. The Ukrainian republic was heavily damaged by the war, and it required significant efforts to recover. More than 700 cities and towns and 28,000 villages were destroyed. The situation was worsened by a famine in 1946–47, which was caused by a drought and the wartime destruction of infrastructure. The death toll of this famine varies, with even the lowest estimate in the tens of thousands. Post-war ethnic cleansing occurred in the newly expanded Soviet Union. As of 1 January 1953, Ukrainians were second only to Russians among adult "special deportees", comprising 20% of the total. In addition, over 450,000 ethnic Germans from Ukraine and more than 200,000 Crimean Tatars were victims of forced deportations. On 26 April 1986, a reactor in the Chernobyl Nuclear Power Plant exploded, resulting in the Chernobyl disaster, the worst nuclear reactor accident in history. This was the only accident to receive the highest possible rating of 7 by the International Nuclear Event Scale, indicating a "major accident", until the Fukushima Daiichi nuclear disaster in March 2011. At the time of the accident, 7 million people lived in the contaminated territories, including 2.2 million in Ukraine. According to the Ukrainian Census of 2001, Ukrainians make up 77.8% of the population. Other significant groups have identified themselves as belonging to the nationality of Russians (17.3%), Belarusians (0.6%), Moldovans (0.5%), Crimean Tatars (0.5%), Bulgarians (0.4%), Hungarians (0.3%), Romanians (0.3%), Poles (0.3%), Jews (0.3%), Armenians (0.2%), Greeks (0.2%) and Tatars (0.2%). The industrial regions in the east and southeast are the most heavily populated, and about 67.2% of the population lives in urban areas. independent of Moscow and the Russian Orthodox Church if the total area of Ukraine will become a battle ground. There will be developments which are comparable to or a merger of the First World War, the Polish Ukrainian War, the Holodomor, the Great Purges and the Nazi, Stalinist and Ukrainian nationalist attrocities during the Second World War ( en.wikipedia.org/wiki/Massacres_of_Poles_in_Volhynia_and_Eastern_Galicia ). There is a Polish minority in Western Poland around the former Polish city of Lviv, called Lwow in Polish, and there are Hungarian and Romanian minorities in Ukraine too. Next to the Jewish, Tartar, Crimean Tatar, Greek, Belarussian, Russian, Armenian, Bulgarian and Moldovan minorities. If minorities are ethnically cleansed, killed, lynched or victims of pogroms Poland, Romania/Moldova, Hungary, Turkey (in defense of the Muslim Tartars), Israel (for Ukrainian and Russian jews), Armenia (for the Armenians), Bulgaria and Greece won't be silent. Different Orthodox countries might side with different sides of the conflicts. The Ukrainian Greek Catholic Church is a church besides the Ukrainian Orthodox Church of the Moscow Patriarchate and the Ukrainian Orthodox Church of the Kyivan Patriarchate and the The Ukrainian Autocephalous Orthodox Church. I hope that the Greek Orthodox Church could play a mediating, diplomatic and peace bring role in this conflict, by urging unity in the Orthodox world and by trying to find a middle ground between the Ukrainian Orthodox Church of the Kyivan Patriarchate on one side and the the Ukrainian Orthodox Church of the Moscow Patriarchate. 7,338,355 Ukrainians are of Russian background, 17.3% of the Ukrainian population. Many of these people live in the eastern Donbas region of Ukraine, but also in Kiev. 337,300 people of the in total of 2,900,920 people of Kiev are ethnic Russian. Ukrainians constitute the largest ethnic group in Kiev, and they account for 2,110,800 people, or 82.2% of the population. Jews 17,900 (0.7%), Belarusians 16,500 (0.6%), Poles 6,900 (0.3%), Armenians 4,900 (0.2%), Azerbaijanis 2,600 (0.1%), Tatars 2,500 (0.1%), Georgians 2,400 (0.1%), Moldovans 1,900 (0.1%). In Lviv, the largest city in western Ukraine and the seventh-largest city in the country overall 728,350 live. The Polish population of the city continues to use the dialect of the Polish language known as Lwów dialect (Polish: gwara lwowska). Ethnic Poles and the Polish Jews began to settle in Lwów in considerable numbers already in 1349 after the city was conquered by King Casimir of the Piast dynasty. Lwów served as Poland's major cultural and economic centre for several centuries, during the Polish Golden Age, and until the partitions of Poland perpetrated by Russia, Prussia, and Austria. In reborn Poland, the Lwów Voivodeship (inhabited by 2,789,000 people in 1921) grew to 3,126,300 inhabitants in mere ten years. As a result of World War II, Lviv was depolonised, mainly through Soviet-arranged population exchange in 1944–1946 but also by early deportations to Siberia. Those who remained on their own volition after the border shift became a small ethnic minority in Lviv. By 1959 Poles made up only 4% of the local population. Many families were mixed. Odessa (Ukrainian: Оде́са [ɔˈdɛsɐ]; Russian: Оде́сса [ɐˈdʲesə]; Yiddish: אַדעס‎) is the third most populous city of Ukraine and a major tourism center, seaport and transportation hub located on the northwestern shore of the Black Sea. A 2015 study by the International Republican Institute found that 68% of Odessa was ethnic Ukrainian, and 25% ethnic Russian. Despite the Ukrainian majority, Russian language is dominant in the city. In 2015, the languages spoken at home were Russian – 78%, Ukrainian – 6%, and an equal combination of Ukrainian and Russian – 15%. Odessa oblast is also home to a number of other nationalities and minority ethnic groups, including Albanians, Armenians, Azeris, Crimean Tatars, Bulgarians, Georgians, Greeks, Jews, Poles, Romanians, Turks, among others. 254,129 Odessians are ethnic Russian and 691,230 Odessians are ethnic Ukrainian. About 2,100 people in Odessa are Polish, 12,400 people are jewish Odessians, 13,300 Odessians are Bulgarians, 7,600 people or Moldovans, 6,400 people are Belarusians and 4,400 people are Armenians. A multi-ethnic city Odessa is. Kharkiv is the second largest Ukrainian city in Northeastern Ukraine. The city has a population of 1,439,036 people of whom 62.8% (903,715 people) of the population is ethnic Ukrainian, 33.2% (463,369 people) of the population is ethnic Russian and 0.7% (10,073 people) of the population is ethnic jewish. This shows how divers, pluriform and not homogenous the Ukraine is. I mentioned the Ukrainian majorities and the large Russian minorities, but didn't mentioned the mixed marriages of ethnic Ukrainians and ethnic Russians. There is no pure ethnic Ukrainian Ukraine, nor is their a pure 100% Russian Donetsk and Luhansk People's Republics in Eastern-Ukraine. There is no solution to this conflict than mutual understanding, understanding that both Eastern-slavic Orthodox christian peoples have long shared histories, cultures and a heritage of coexistance in Czarist Russia, the SovjetUnion and in Independent Ukraine. The fact that churches in Ukraine that were under the Moscow Patriarchate have been forcibly seized and transferred to the Kiev Patriarchate, is reason for concern, because if the Russian Orthodox church is furious, the Kremlin will be worried too. When Ultra-Nationalist far right Ukrainain militants broke into a church in western Ukraine, beat up a priest, drove parishioners away and locked the building, that is a worrisome thing. Were will it end? Church leaders, politicians, diplomats, the Greek Orthodox church, the World Council of Churches, the Vatican, and Polish, Hungarian, Romanian, Czech and Slovak diplomats with both Russian (Moscow) and Ukrainian (Kiev) experience should intervene. Also the Americans, Canadians, British, Germans, French, Italians, United nations, OSCE (Organization for Security and Co-operation in Europe), the Netherlands, Belgium, Switzerland, Sweden, Norway, Finland and Denmark should act in a diplomatic multilateral way. A large scale spreading of the East-UKrainain civil war to the total territory of Ukraine must be prevented at all cost. If not you will have a devastating, vicous, bloody war in Eastern-Europe at the border of Central-Europe. A war that will look like the Eastern front during the second wolrd war, with the same kind of large battles and loss if civilian lives. Orthodox Church always fascinated me with their long traditions. I am not surprised that Russian church split, since Ukraine is so sensitive for them. It is a pity since it makes the church weaker....frankly, I did not even know that they are still together and respect the same communion. I thought that the Greek and Russian churches were already separate entities for a long time! I have to say that I nearly in the same position like you are. I have the same fascination with the Russian Orthox church since my childhood, because my father liked Russian music and part of that music was Russian Orthodox choir music next to Russian folk music and music of the Red army. The Orthodox faith has an intersting mysticism and spirituality. Their icons, their church bells, the way they built their churches, the interior of their churches, the deep voices of the sining Russian orthodox monks. The depth and devotion of the Russian Orthodox faith. It fascinated me since my teenage years. It was fascinating watching these video's I found on an Orthodox video chanal, that the Greek Eastern Orthodox Church of the Byzantine Empire still lives today in Istanbul, the old Constantinople. It is surprising to me too that the Ecumenical Patriarch ("His Most Divine All-Holiness the Archbishop of Constantinople, New Rome, and Ecumenical Patriarch"), "His Most Divine All-Holiness the Archbishop of Constantinople, New Rome, and Ecumenical Patriarch") the Archbishop of Constantinople–New Rome ranks as primus inter pares (first among equals) among the heads of the several autocephalous churches that make up the Eastern Orthodox Church. That the Greek-Turkish Ecumenical Patriarch of Constantinople (Istanbul), Bartholomew I of Constantinople, is widely regarded as the representative and spiritual leader of the 300 million Eastern Orthodox Christians worldwide. The term Ecumenical in the title is a historical reference to the Ecumene, a Greek designation for the civilised world, i.e. the Roman Empire, and it stems from Canon 28 of the Council of Chalcedon. Like you Jaga, I thought that Greek Eastern Orthodox Church of Byzantine and the Russian churches were already separate entities for a long time! After the schism they will. This schism is very dangerous, because disputes about church property, parishes, territory and influence will possibly lead to a large scale conflict on the entire territory of the Ukraine. I talked with Orthodox christians in the Netherlands, and they confirm that the situation is very serious. One Dutch fellow beloning to the Russian Orthodox church said to me: |In fact 5 year ago there was already a civilian clash in the cosmopolitan city Kiev with the bloody Eurmaidan when the Ukrainains of the city wanted more democracy and the rural area's not. (Mind your this are the Russian Orthodox fellows words and not mine). "These Ukrainian churches were recognised nowhere until the sudden dicision by Bartholomeus Bartholomew I of Constantinople. Again, this can lead to war, a war which could be fought in the East-, Center-, South- and even West of the Ukraine. In that case the Polish army will be on high alert, and Europe might have floodwaves of Ukrainian and Russian refugees and Polish, Hungarian, Romanian, Jewish, Tartar, Armenian and Georgian and Moldovan minority group refugees who will escape ethnic cleansing and probably looting and murder? Let's hope that mediation, negotiations and sensible behaviour of the various Orthodox patriarchs will calm the sitation down. But it is a fact that there has come to existence now a seperate Ukrainian church, which has separated itself from Moscow. Jaga, what do you think, guys, John, Eric, Karl, Kaima (Ron), Ludwik, Jeanne and others, what do you think? This nice video shows building of a lack of trust between both churches. People would still go there, since they need a worship place. Did you put the right link in this thread Jaga? I realize the lack of response to this topic by my self. With out any excuse, I know little of the Orthodox Churches of Russian and Greek. The Ukrainian people I have met in a social setting, we become good friends, of their politics I must say I have avoided the subject for the most part with them. Speaking out only as an opinion: It is my sincere belief that of the Ukrainian Churches we are speaking of, these are the houses of God, not to be used as a point of power by any man. The reason of being for such men as church leaders, is to provide a place of worship for the people and provide to them the word of God. Other wise my self do not make one religious name over another as long as it is the word of God as described in a Christian manner. If perhaps my training and education was of the nature of religion, then perhaps the wording as above would have been more precise. For as a lay man, I may only place on paper what is in my heart that is withen context of the subject. it is almost as like you used the phrase: Then Jesus said to them, "Give back to Caesar what is Caesar's and to God what is God's". Unfortunately things are usually not that pure and easily split; still you are quite right, there should be no politics mixed into the Church's message.